In this intriguing classic murder mystery among the upper classes in 1920s London we are breathing in the heady heavy fogs of the Golden Age. The age of the few decadent bright young things, of the many older generation harmed by unspeakable horrors of war and of the massive class divides. Mr Huang has a style to recreate the atmospheric surroundings of St James's Clubland lying between the exciting and lively Theatre-land and the glamorous and stylish Mayfair. The author's detective is a Mr Eric Peterkin a former Lieutenant of the Royal Fusiliers during the Great War now a literary man reviewing detective fiction of all things. Peterkin is a gentleman and an officer with illustrious forebears but, despite these obvious advantages is on the outside of club society. Being part Chinese, his mother was from China, he regularly receives barbed comments about his background and appearance which he does well to rise above. The murder takes place at Peterkin’s club, The Britannia Club. A new member, Albert Benson, only admitted the previous day is murdered during his first night. Before his death, Benson had told Peterkin that he was going to right a great wrong from the past. The members of the club are all gentlemen and army officers who have fought for the Empire. There are only a handful of suspects all Officers of the club. Peterkin is disturbed by what the murdered man had said. 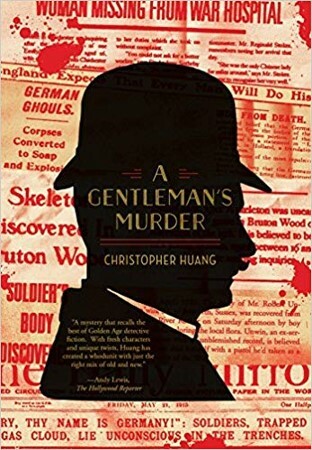 He becomes more involved when he sees the investigating police officer tamper with the evidence in the dead man's room. Despite being told by the Police Inspector to stay out of the case, Peterkin decides he must find the killer. And in so doing, he will risk the wrath of the police force, his status with fellow club members and perhaps his life too. The pace and rhythm of the writing is reminiscent of the early Golden Age greats weaving the intricate details of the plot and building the tension to a dramatic conclusion. But, unlike those dramas of a bygone era, Huang’s man of Oriental appearance is the hero rather than the villain.